“Father John” has been Rector (Senior Pastor-Priest) of St. Andrew’s since 2004. He is a graduate of The School of Theology, Sewanee, Tennessee with a Master of Divinity in 1996. He was ordained to the priesthood in 1997. He received his Doctor of Ministry Degree from Virginia Theological Seminary in 2011. Prior to ordained ministry, John was a Licensed Professional Counselor, with a Master’s degree in Counseling from the University of South Carolina, working in substance abuse treatment and family counseling. 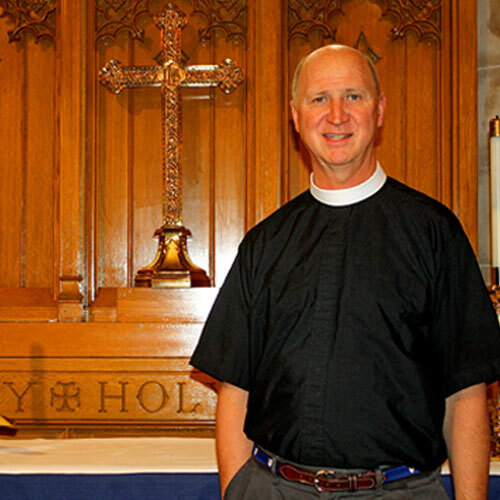 Prior to coming to St. Andrew’s, John was the Rector of St. Paul’s Episcopal Church in Clinton, North Carolina; and before that, was Senior Chaplain of Christ Church Episcopal School in Greenville, South Carolina. John has served the Diocese of East Carolina as Dean of Trinity Deanery, Standing Committee, Board of Trustees and a four time Deputy to The General Convention. He also served for many years as chaplain for the Clergy Leadership Project with Trinity Parish Wall Street. Father John brings the gifts of empathy, connectedness and adaptability to his ministry. These are seen in the deep relationships that he has developed over the past fourteen years here at St. Andrew’s, and the pastoral care he provides. He is also a gifted preacher, teacher and listener. He enjoys playing guitar, bagpipes, hiking, biking, and kayaking. He and his wife Mary Withington enjoy making their home in Morehead City, and gardening and traveling together.